Cape Town - At least for the rest of this summer, still to feature five home Tests for South Africa, expect the Proteas to stick confidently now to the status quo of AB de Villiers batting at No 5 and keeping wicket as well. Who knows, the formula may even stretch a lot, lot further than that ... and perhaps only be altered if there is a fresh flare-up of the versatile player’s occasional back troubles. On Sunday, as the Hashim Amla-anchored tourists only turned the screws mercilessly on Australia in the decisive final Test at the WACA, De Villiers went a long way to burying, for the time being, the debate that has raged spiritedly around his suitability to both chores. In returning to his pulsating best as an attacking batsman in the monster South African second innings, with an innings of 169 that featured his most vintage hand and footwork, the right-hander almost certainly ensured that his (desired, importantly) dual role will continue. Had he under-delivered with the blade again, the issue would justifiably have returned to the team strategists’ table, even if there is also no guarantee that a decision would have been taken to actually relieve him of the gloves. There has been a fair amount of statistical ammunition, after all, to suggest that ‘keeping has been impeding his ability to contribute to prior known standards in a key slot in the Proteas’ order. 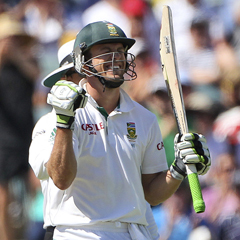 Since assuming the wicketkeeping role as a result of Mark Boucher’s forced retirement, De Villiers had not managed so much as a half-century in nine knocks and his Aussie series had shown only 107 runs in five. But all batsmen go through lean spells and former national captain Kepler Wessels is just one of many commentators who insist that there is no link. Wessels said behind the SuperSport microphone in Perth on Sunday: “He just had some issues with his footwork, that were resolved today – his form had absolutely nothing to do with the wicketkeeping issue. Indeed, it is hard to imagine De Villiers not banking anything but huge confidence from the WACA knock, which also represented his fifth highest score in 135 turns at the Test crease and helped caress his average (49.11) back closer to the treasured 50-mark. Perhaps critics forget that the 28-year-old crowd-pleaser has had previous batting dips in his largely stellar career, when he has been nowhere near the ‘keeping slot. There was a pretty lengthy period between April 2005 and January 2008, for instance, when he went 44 Test innings without a century, although that partly coincided with the closing phase of his chapter as an opening batsman. It is also worth remembering that in an interview with Sport24 before the team’s departure for Down Under, coach Gary Kirsten candidly indicated that De Villiers keenly wanted to confirm himself as the country’s best gloveman in the extended format. He also hinted that if the player did, in fact, scale back his responsibilities behind the stumps, it might now more realistically come in the limited-overs arena. That could be music - maybe even as early as New Zealand’s presence on South African soil later this month? - to the ears of potential candidates like Dane Vilas, Quinton de Kock or Heino Kuhn. At the same time, De Villiers’s sumptuous return to prime batting form may mean the luckless, patient Thami Tsolekile has to wait even longer for any possible additions to his last Test appearance, as far back as December 2004 against England at Port Elizabeth. There can be no doubting that De Villiers wearing the Test gloves greatly aids the balance of the Proteas’ five-day team, even if the discussion is unlikely to go completely quiet. That sound Australian cricketing judge Tom Moody has made the point that, with Jacques Kallis in his twilight, the onus may only increase in the coming years on De Villiers to make weighty middle-order runs.